16 Marlborough is located on the south side of Marlborough, between Arlington and Berkeley, with 14 Marlborough to the east and 18 Marlborough to the west. 16 Marlborough was built in 1865. In his Houses of Boston’s Back Bay, Bainbridge Bunting does not attribute the house to a specific architect. However, an August 19, 1865, article in the Boston Daily Advertiser indicates that it was designed by architect James H. Rand, and he is identified as the architect in subsequent litigation about the house. 16 Marlborough was built for oil and starch merchant John Mixer and his wife, Marianna Parker (Curtis) Mixer. They previously had lived in Jamaica Plain. John Mixter purchased the land for 16 Marlborough on January 16, 1865, from Samuel F. Dalton. It was composed of two lots Samuel Dalton had purchased in March of 1863, a 7 foot lot to the east which he purchased from William Thomas, and an 11 foot lot to the west which he purchased from Caleb William Loring and Charles F. Choate, trustees. Both of these lots were part of larger parcels purchased from the Commonwealth of Massachusetts on May 2, 1860. The parcel originally purchased by William Thomas had an 84 foot frontage and included the three lots for 10-12-14 Marlborough. William Thomas kept the 33.5 foot lot at 10 Marlborough for his own house, and sold a 25.5 foot lot in December of 1862 for 12 Marlborough to the trustees for Harriet Jackson (Lee) Morse, the wife of Samuel Torrey Morse. Because both parties were “desirous of securing the rear of their respective lots from obstructions to light and air,” they had entered into an agreement that, for a period of twenty years, neither would build any structure more than eight feet high in the rear of the lots at any point further than 75 feet south from Marlborough (thereby creating a rear yard setback of 37 feet from the alley). The restriction also applied to the remainder of William Thomas’s original parcel, a 25 foot lot to the west. When he sold it on March 31, 1863, to Charles U. Cotting (an 18 foot lot) and Samuel F. Dalton (a 7 foot lot), all four owners of the property entered into a new agreement, retaining the 75 foot limit on the depth of the structures at 10 and 12 Marlborough, but allowing a depth of 82 feet on the lots further west, where 14 and 16 Marlborough would be built. The new agreement also expired after twenty years. Click here for an index to the deeds for 16 Marlborough. The Mixers lived briefly at 16 Marlborough, but moved by 1866. By 1869, they lived 23 Beacon. On December 6, 1865, 16 Marlborough was purchased from John Mixer by Mrs. Marianne (Mason) Crafts, the widow of importer and textile manufacturer, Royal Altamont Crafts. He had died in May of 1864 in Switzerland. As originally built, 16 Marlborough had a bay almost the entire width of the house, with a porch extending to the west on the same plane as the front of the bay, topped with a balustrade. On the western side, the porch area extended out beyond the stairs of the neighboring house to the west at 18 Marlborough and had a window looking onto the neighbor’s stairs. 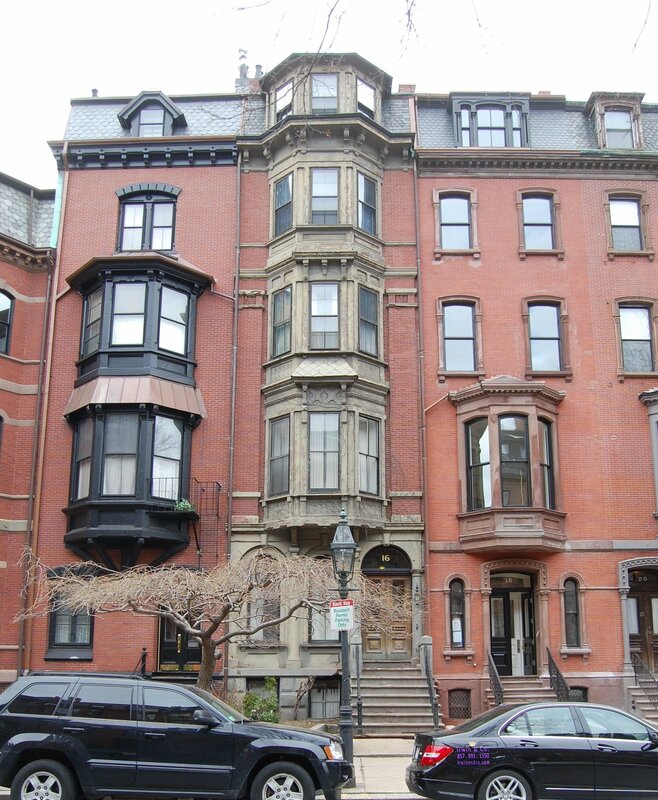 Marianne Crafts lived at 16 Marlborough while the controversy over its design was being litigated, but by 1870 had moved to a new home she had built at 304 Berkeley. On February 10, 1871, 16 Marlborough was purchased from Marianne Crafts by George Washington Warren. He and his wife, Georgiana (Thompson) Warren, made it their home. They had lived in Charlestown in 1870. G. Washington Warren was an attorney and municipal court judge for Charlestown. He previously had served in the State House of Representative and State Senate, and as mayor of Charlestown. The Warrens continued to live at 16 Marlborough in 1873, but moved thereafter to the Hotel Vendôme. He continued to own 16 Marlborough and lease it to others. By 1875, it was the home of wool merchant Lemuel Cushing Kimball and his wife, Addie Maria (Hall) Kimball. They previously had lived at 42 Hancock. 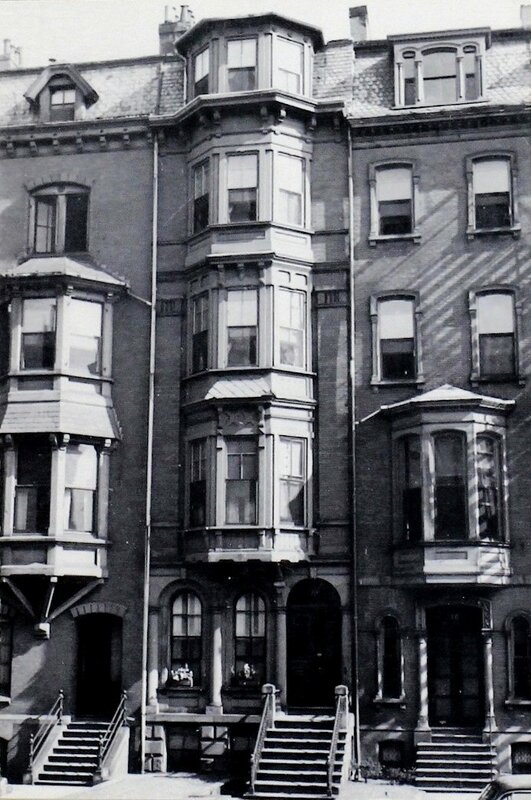 They continued to live at 16 Marlborough in 1879, but had moved to 44 Newbury by 1880. By the 1879-1880 winter season, G. Washington and Georgiana Warren moved back to 16 Marlborough. They continued to live there in 1882, but moved soon thereafter to 12 Beacon. By the 1882-1883 winter season, 16 Marlborough was the home of Albert Harrison Hoyt and his wife, Sarah Frances (Green) Hoyt. A lawyer by training, Albert Hoyt had been a paymaster in the Civil War, brevetted with the rank of Lt. Colonel, and then served as chief treasurer of the National Railroad Transportation Company from 1867 to 1869. He was editor of the New England Historical and Genealogical Register from 1868 to 1875, and then went to Cincinnati as professor of history and English Literature at the Bartholomew English and Classical School. 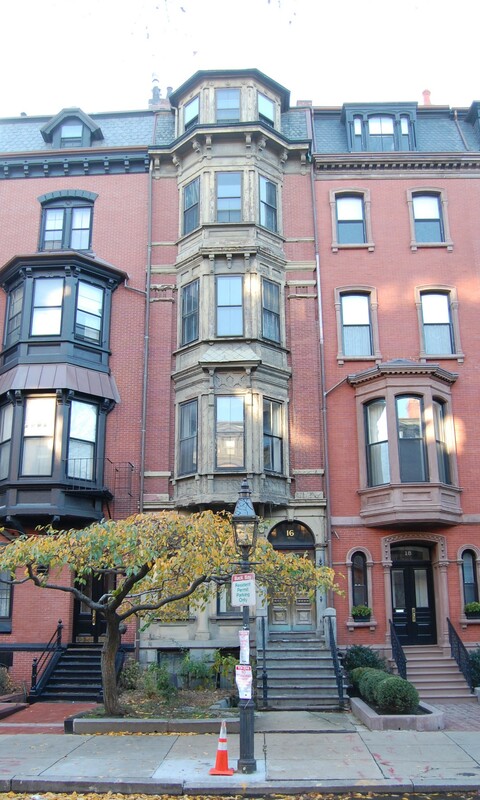 The Hoyts returned to Boston in 1882, and in 1887 he became a clerk in the US Sub-treasury in Boston. Initially, the Hoyts leased 16 Marlborough from the Warrens. G. Washington Warren died in May of 1883, and on April 4, 1884, Miss Ida Means Mason foreclosed on his mortgage to Marianne Crafts (Marianne Crafts had assigned the mortgage to Ida Mason, who was her niece, the daughter of her brother, Robert Means Mason). On May 12, 1884, Ida Mason acquired the interests of the estate of Isaac Warren, which held a second mortgage on the property. Ida Mason lived at 1 Walnut. The Hoyts continued to lease 16 Marlborough from Ida Mason and on December 4, 1889, Sarah Hoyt purchased the property from her. Sarah Hoyt died in June of 1893, and Albert Hoyt moved soon thereafter to 5 Walnut. He continued to own 16 Marlborough and lease it to others. By the 1893-1894 winter season, 16 Marlborough was the home of Adelia (Conant) Winslow, the widow of Thomas S. Winslow, and their daughter, Adelia Isabel Winslow. They previously had lived at 23 West Cedar. 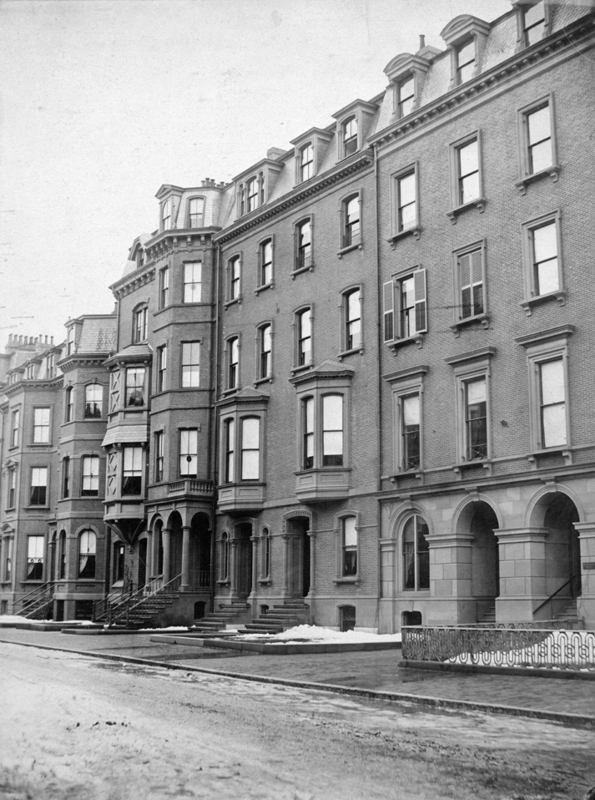 They continued to live at 16 Marlborough during the 1894-1895 season, but moved thereafter to 71 Marlborough. By the 1895-1896 winter season, 16 Marlborough was the home of Miss Dora Brereton. She had lived at 286 Beacon in 1892. She continued to live at 16 Marlborough during the 1896-1897 season, but moved thereafter. By the 1897-1898 winter season, 16 Marlborough was the home of Mary Elizabeth (Coy) Weymouth, wife (possibly the widow) of Charles Henry Weymouth, and their children. She was a dressmaker and operated 16 Marlborough as a lodging house. On January 19, 1899, 16 Marlborough was purchased from Albert Hoyt by Herbert Austin and Walter Austin, trustees under the will of their father, James Walker Austin. Herbert Austin was an iron and steel merchant. He was unmarried and lived at 9 Arlington with his mother, Ariana Elizabeth Smith (Sleeper) Austin. Walter Austin was an attorney anmd author; he and his wife, Mabel Lindsley (Frazer) Austin, lived in an apartment at 199 Marlborough. 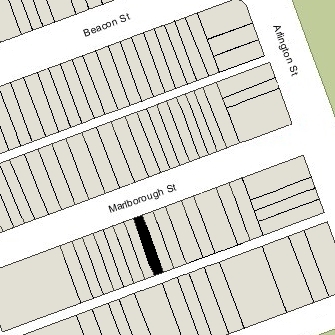 It appears that the estate of James W. Austin purchased 16 Marlborough as an investment. Mary Weymouth continued to live and operate a lodging house at 16 Marlborough until about 1906. On September 27, 1906, 16 Marlborough was acquired from the James W. Austin estate by Dr. John Templeman Bowen, a dermatologist and professor of dermatology at Harvard. He and his brother, James Bowen, a stockbroker, lived at 14 Marlborough. 16 Marlborough was not listed in the 1907 and 1908 Blue Books. By the 1908-1909 winter season, 16 Marlborough was the home of Prescott Bigelow, a stockbroker, and his wife, Bessie Paine (Nazro) Bigelow. They previously had lived at 82 Bay State Road. They continued to live at 16 Marlborough until his death in January of 1918. 16 Marlborough was not listed in the 1919 Blue Book. By the 1919-1920 winter season, it was the home of Joseph Warren Merrill, Jr., and his wife, Marion Louise (Raymond) Merrill. They also maintained a residence in Manchester. He was a trustee of estates. On November 8, 1920, Marion Merrill purchased 16 Marlborough from John T. Bowen. They continued to live there during the 1921-1922 season, after which they moved to the Copley Plaza Hotel. On May 1, 1922, 16 Marlborough was purchased from Marion Merrill by Miss Cornelia Frost, who maintained it as a lodging house. 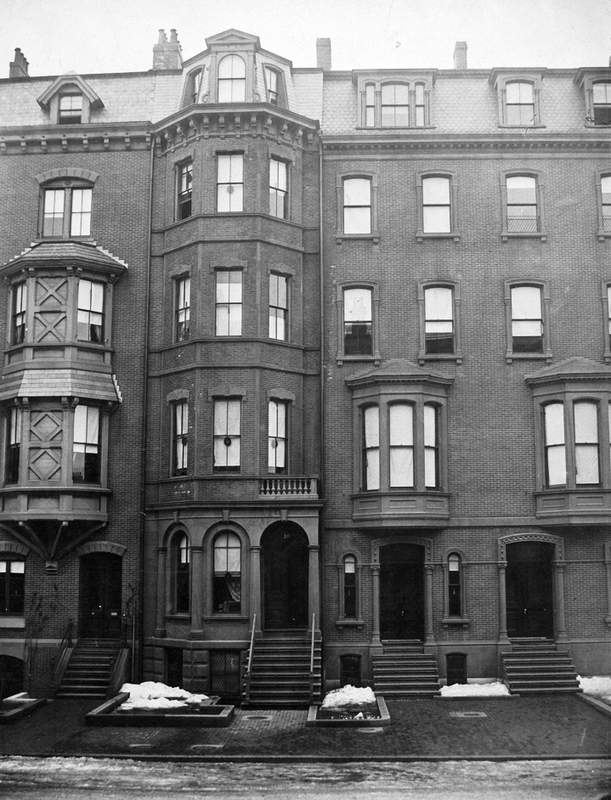 She had lived at 140 Beacon the previous year with her mother, Harriet (Bradstreet) Frost Lane, the widow of Joseph Frost and of Charles L. Lane (Harriet Lane died in June of 1922). She continued to live and operate a lodging house at 16 Marlborough until her death in October of 1940. Among Miss Frost’s long-term lodgers was Miss Mabel F. Hale, who lived at 16 Marlborough from the mid-1920s until 1940. She was a minimum wage investigator for the Massachusetts Department of Labor. After Miss Frost’s death, she moved to 39 South Russell. Also among the long-term lodgers was Howard Everett Titcomb, a church organist, composer, and teacher at the New England Conservatory, who lived there from about 1927 until about 1935. He then moved to 54-1/2 Temple, but moved back to 16 Marlborough by 1938, where he remained until 1940. After Cornelia Frost’s death, 16 Marlborough was inherited by her first cousins. the children of her mother’s brother, James Edwin Bradstreet and his wife, Caroline (Carrie) L. Calrow: Dudley E. Bradstreet, John Endicott Bradstreet, and Ruth Emerson (Bradstreet) Hoyt, the wife of Howard Henry Hoyt. Ruth Hoyt lived in San Francisco, J. Endicott Bradstreet lived in Chicago, and Dudley Bradstreet lived in Evanston, Illinois. In November of 1940, the estate of Cornelia Frost filed for a lodging house license (which probably had never before been obtained). The Building Department informed the estate’s representative, Harding Hall, that no license could be issued until the permitted use of the house was changed from a single-family dwelling to a lodging house and necessary egress and fire safety improvements were made. On June 11, 1942, 16 Marlborough was purchased from Cornelia Frost’s heirs by Arthur W. Krey, trustee of the Cypress Trust. On December 1, 1942, 16 Marlborough was acquired from Arthur Krey by Miss Edna M. Gorman (born Mary Edna Gorman). She continued to operate a lodging house for almost forty years, although the legal occupancy of the house appears never to have been changed from a single family dwelling. On August 28, 1981, 16 Marlborough was purchased from Edna Gorman by Robert A. Pantano. On March 8, 1993, 16 Marlborough was purchased from Alan and Lois Green by the 16 Marlborough Corporation (organized in Panama with its principal offices in New York City). The property remained a three-family dwelling in 2015.